You can delete out parts of the quoted reply to save space and to highlight the exact part you want to quote. 2) To add a quote to any text simply highlight the text and ht the quote button It's the last button on top right, just under color. Looks like a tan bubble. See picture below. This type of quote will not have the member name attached to it (works good for general quote). 3) To quote 2 separate people in same reply use both #1 and #2 above. Quote person 1 and then scroll down and copy person 2's text and wrap it as outlined in #2. You can add the member name to the 2nd quote by simply adding =membername in the first quote tag. See picture below. Last edited by mceb; 05-08-2005 at 06:40 AM. Last edited by solsticeman; 05-04-2005 at 03:54 PM. Normally you can just paste a URL address into a thread and it becomes a link but if you want the fancier link with a formatted name like "link to Autoweek article" then try this below. 1) Copy the link from another browser window (or tab depending on your browser). 4) In the first box you are prompted with enter a short name like "Link to article on Yahoo". Click OK.
Last edited by mceb; 05-08-2005 at 06:39 AM. With our famous log threads this type of option can be very handy. Set it as your default and the most recent posts are always at the top of the thread. It takes a little getting used to at first because you read in reverse chronological order but it's great on long multi-page threads because you don't have to change pages to get to most recent posts! 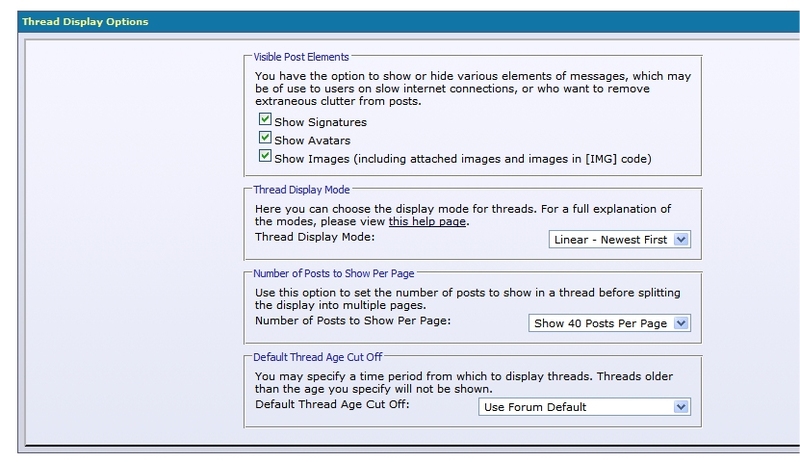 4) Change the Thread Display Mode to "Linear - Newest First"
Change the "Number of Posts to Show Per Page" to 40 to fit more on a page. Last edited by mceb; 05-11-2006 at 02:58 PM. Note: Due to bandwidth issues attaching pictures into a post is reserved for the founding 1000 forum members and supporting users and vendors. 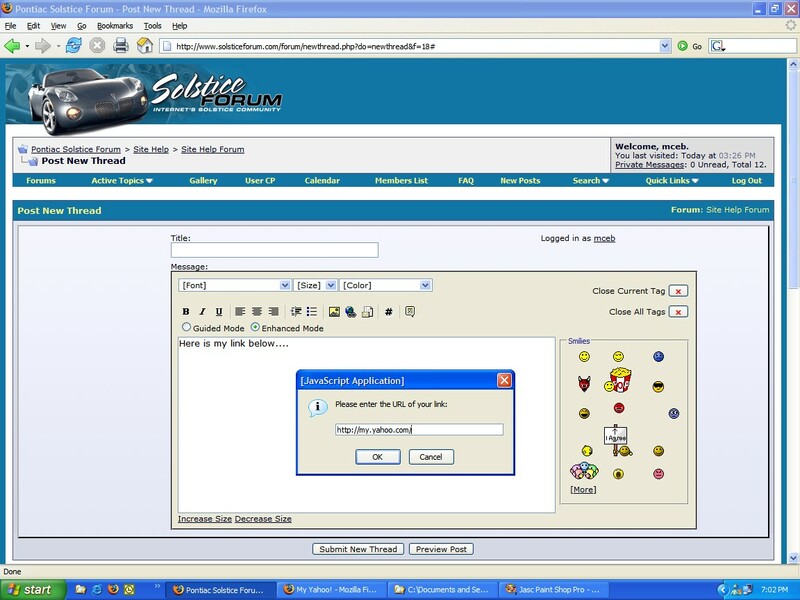 Other forum users should use a free picture hosting site such as www.putfile.com and post back links or use the IMG tags to embed pictures directly into a post. 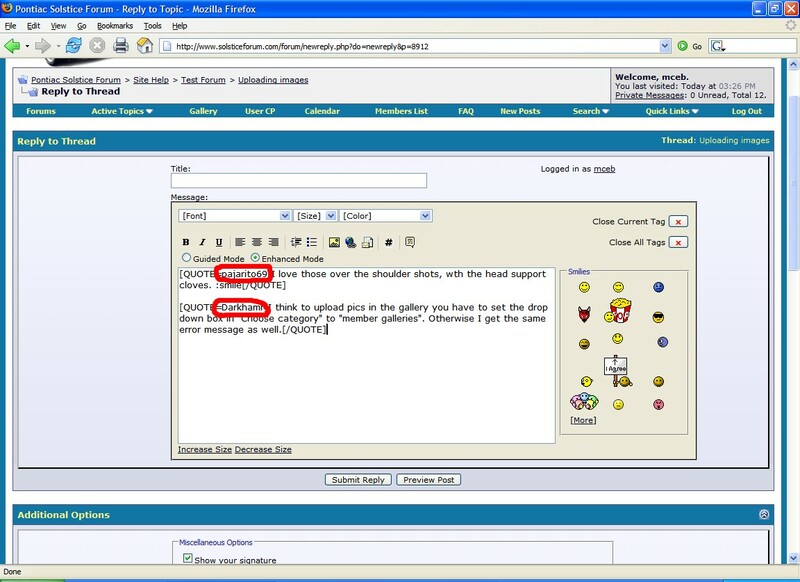 See this post for instructions on how to post pictures from a 3rd party site. If it's an important image to the community a mod can add an image to any user's post as well. 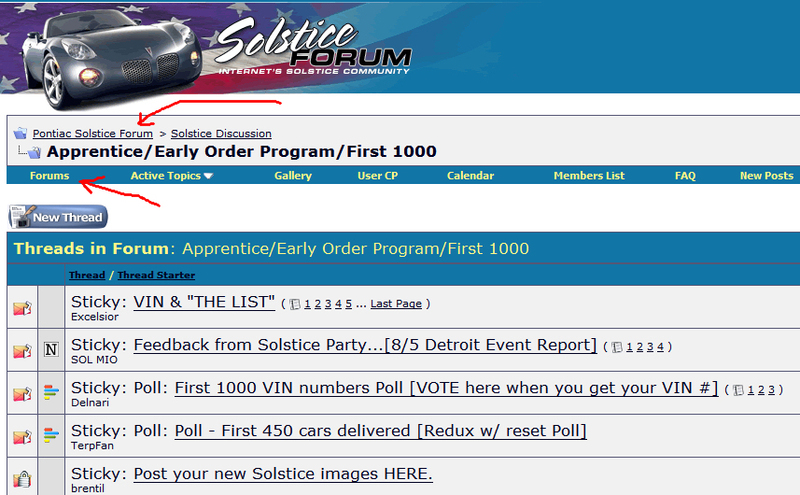 Another option is our gallery here at SolsticeForum since that is available to all forum members. Here's a step-by-step on how to attach files to a post. 3) Clicking that button opens up a new smaller popup window shown in image 2. 4) Navigate to the location of the file on your PC hard drive using the browse button. 5) Click the upload button to transfer the files (you see them listed aftewards). 6) Click the close this window button and the smaller window disappears. 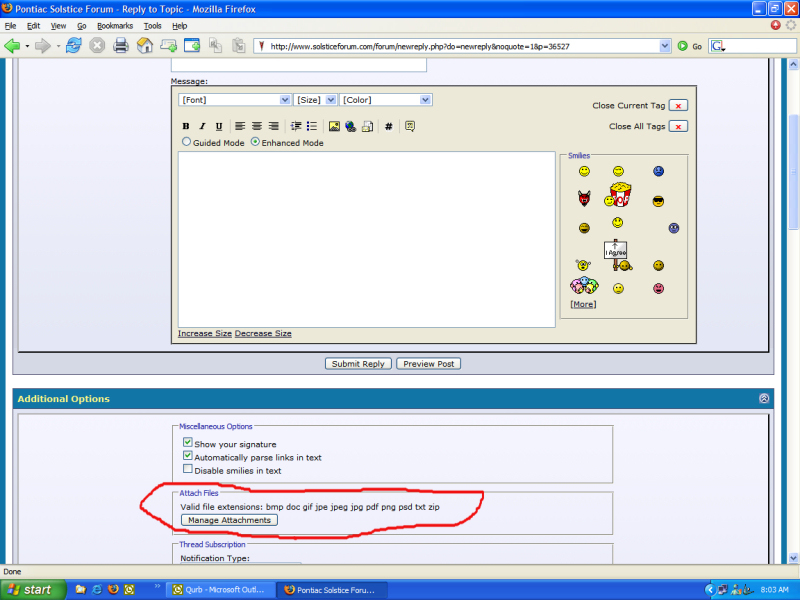 7) Add text and click submit reply. You can upload 1-5 files in 1 post. 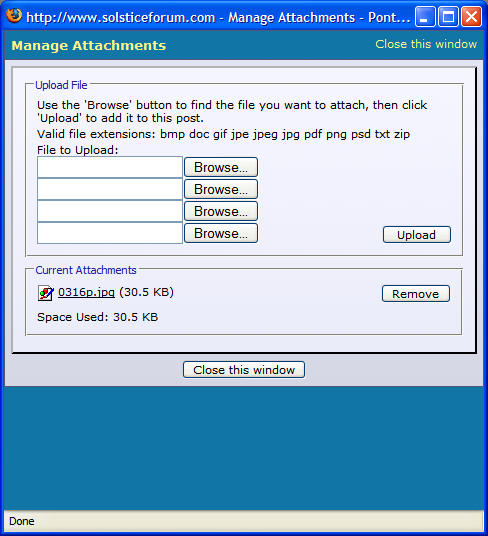 Only certain file types are allowed (Valid file extensions: bmp doc gif jpe jpeg jpg pdf png psd txt zip). Last edited by mceb; 11-03-2006 at 08:02 AM. 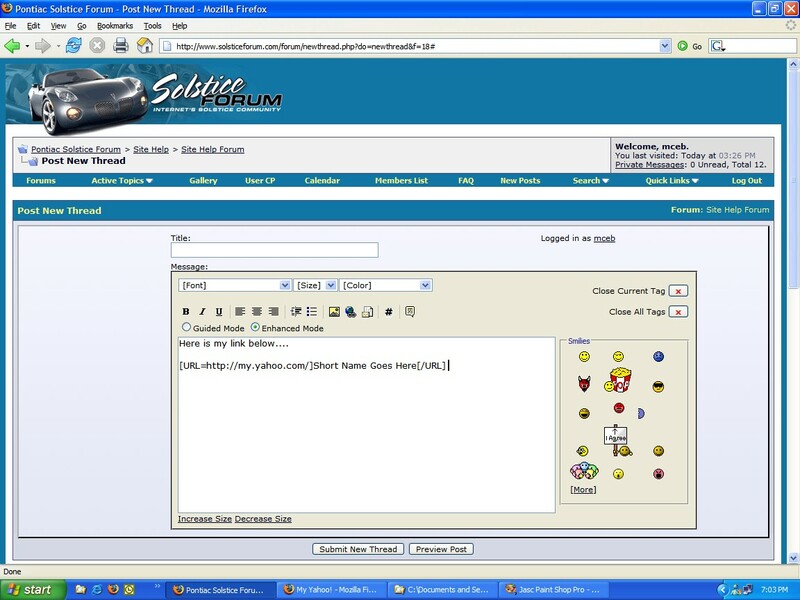 The main forum is divided into different sub-forums. 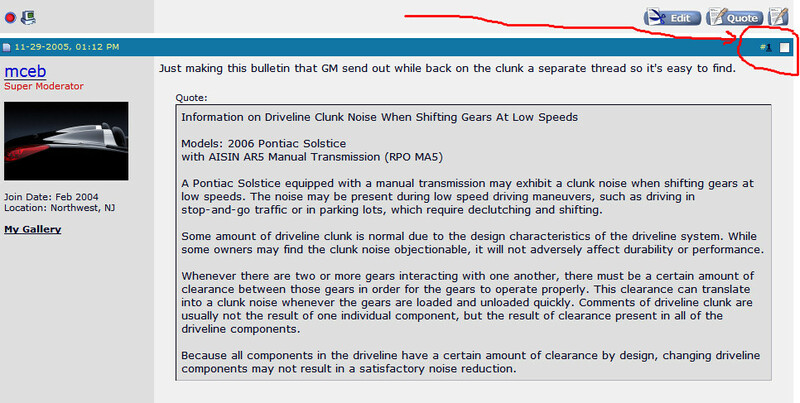 Each sub-forum is on a specific topic. 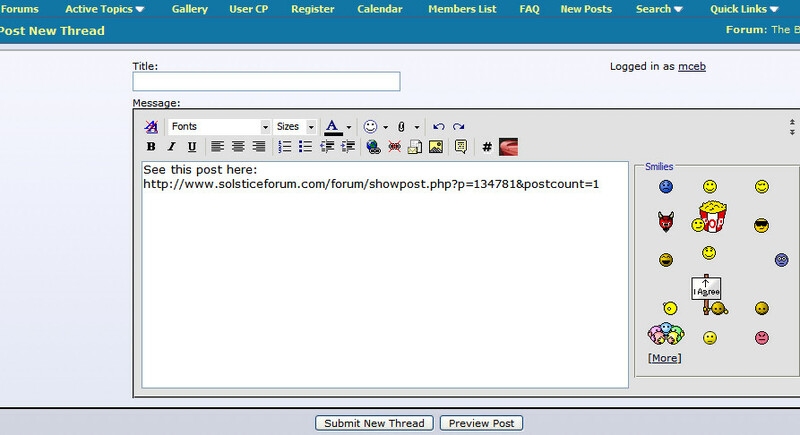 You need to pick the best sub-forum for your post based on its content. 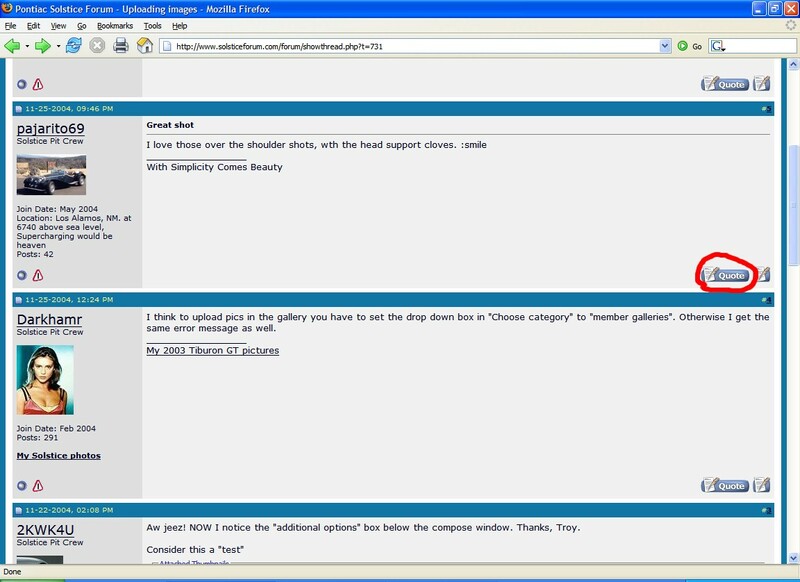 As you navigate to a sub-forum you may need to go back up to the top to see the various sub-forum selections again. 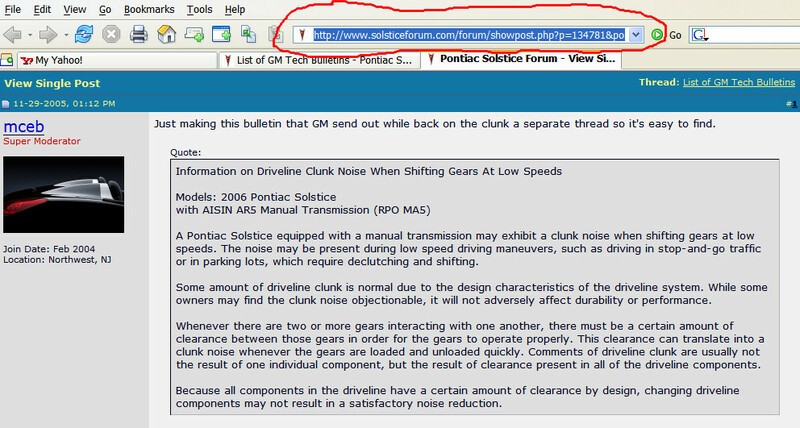 To change to a different forum click the "forums" link in the blue menu bar OR the "Pontiac Solstice Forum" link just under the car picture (see attached picture). This will take to to the top of the "tree" where you can see all the different sub-forums listed. 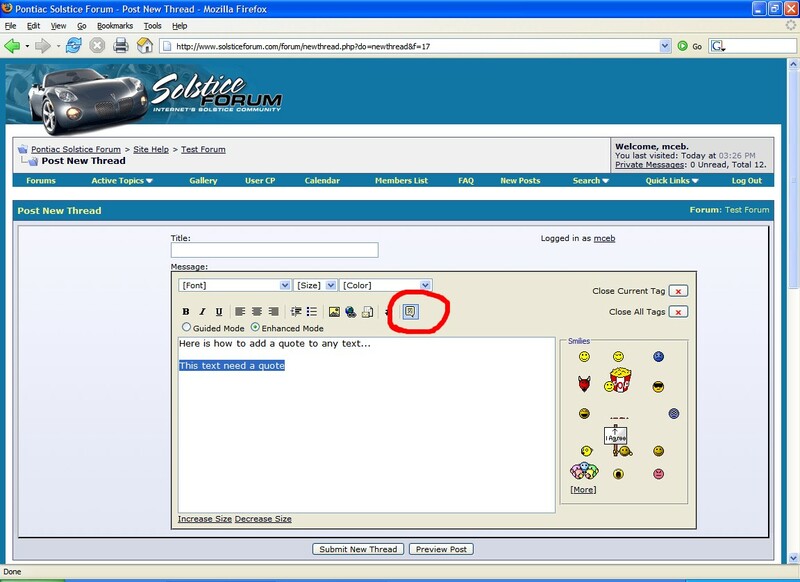 Clicking any sub-forum name drills you down into that forum to view the threads. Last edited by mceb; 08-26-2005 at 02:41 PM. 1) Start a new thread using the new thread button. Add some text to introduce your poll. 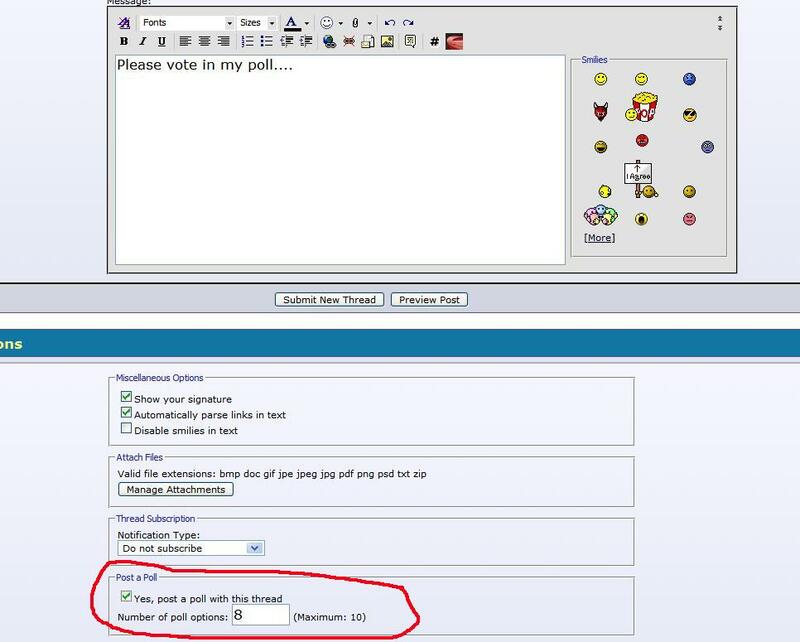 2) Just under the text box click the checkbox called "Post a Poll" and default change the number of poll options (answers, default is 4, max is 10). 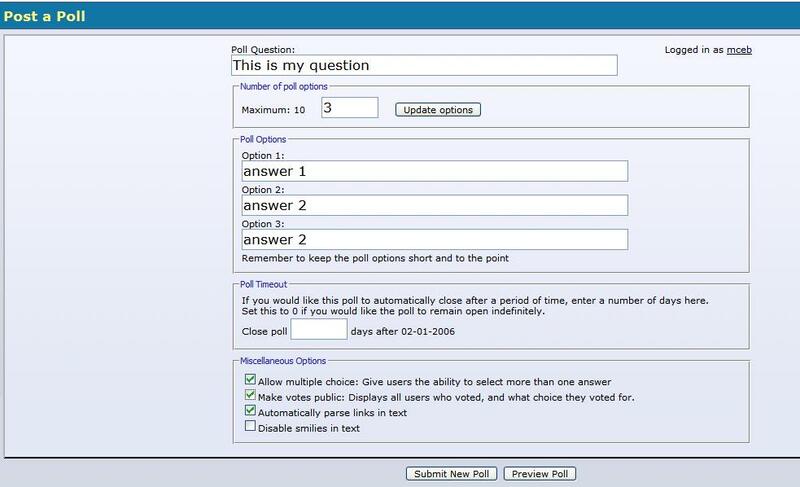 4) This takes you to a 2nd page called "Post a Poll" which allows you to add the poll question as well as the options (answers). Just fill in these options, use the "update options" to add/subtract answers if you need more/less. Mods can add a poll to an existing thread if needed just ask. Mods can not change the optioons for multiple choice or public voting so choose those carefully. Last edited by mceb; 02-01-2006 at 03:55 PM. How do I link to a single post and not a whole thread? 2) Clicking that post # should open a new window or tab depending on your browser. You'll notice the URL has some extra info tagged onto the end including the post=. Copy this URL onto your clipboard (cntrl-C or right click copy). See pic #2. 3) Go to the place where you want to drop the link back to that post such as reply or new thread and just paste in the URL (pic #3). 1) Copy the location of your image. Most of these sites have a way to see or send the URL address of your picture to friends. It will look something like this "http://img1.putfile.com/thumb/9/26511292362.jpg" Notice it ends with the image extension jpg which is a format for pictures. 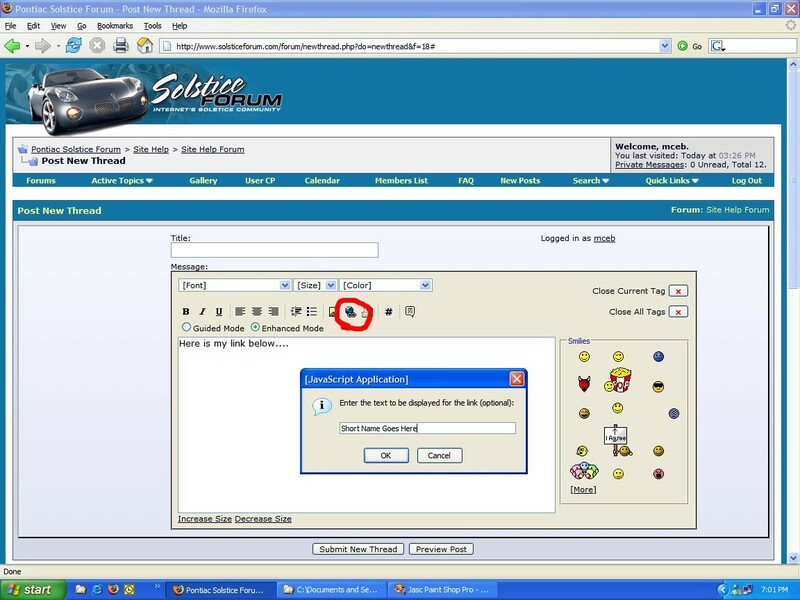 Highlight entire the URL address and copy it using right click "copy" or cntrl-c keys. If all else fails try right click 'copy image location' to get the URL. 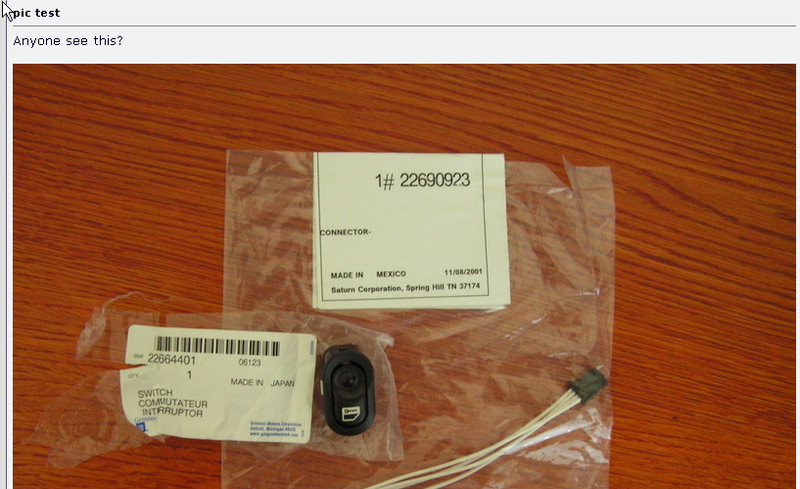 2) Paste the URL address of the image over here in a post using right click "paste" or cntrl-v keys. Note: you could stop here and users at SolsticeForum could follow these links to see your picture but if you would rather your pictures appear inline within your post continue with the instructions below. 3) Wrap the URL address with IMG "image" tags. Notice the ending tag is a little different than the starting tag because it adds a slash /. See the attached images marked in red for examples of what this looks like. Note: as an alternative method there also is a button on the toolbar that walks you through this by automatically building the line with IMG tags if you'd rather not type it but typing IMG twice with brackets isn't too much work. If you want to try the altenative method the button looks like a yellow square with a mountain. See attached image for example. 4) When your reply is posted the URL address wrapped in IMG tags will automatically convert to a picture. See attached images for before and after examples. Last edited by mceb; 12-27-2006 at 10:57 AM.